Elkville (population 1,001) is located in far southern Illinois in the northwest portion of Jackson County. Carbondale and Southern Illinois University are located just 12 miles south of Elkville. U.S. Route 51 is the main roadway through Elkville. The Illinois Central Gulf Railroad travels through Elkville as well. A branch of the Little Muddy River flows just south of town. Elkville was officially established in 1861 and named after the elk that roamed the prairie up until the 1830s. The history of Elkville's educational efforts is in need of research. We are confident that Elkville had at least a grade school started by the late 1800s. We are also confident that Elkville had a high school established by the early 1900s. Elkville High School served the town quite proudly through the early 1960s. In the late 1950s and early 1960s consolidation talks were started between the residents of Elkville, Vergennes, and Dowell. This effort was finalized in 1962 with the creation of the Elverado School District. 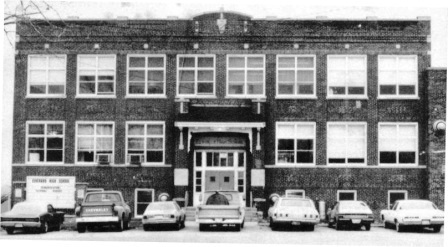 The high school was located in Elkville and remains there even today. "The old Elkville High school was torn down in the late 90's, early 2000's. Not sure of the exact year but I will get it for you. They built the new high school behind the old one, then tore the old school down. Only remaining part is the basketball gym." Elkville HS team nickname: the "Bluebirds"
Elkville High School boys competed in basketball for sure (www.ihsa.org). Football was also a prime sport for the Bluebirds. We are confident that baseball and track were also offered. School fight song, team records, and coach's names are being sought. The Elkville Bluebirds were a force to be reckoned with in their neck of the woods. 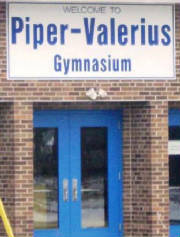 A total of SIX District titles and one Regional title were won by the Bluebirds during their existence as a solo high school. 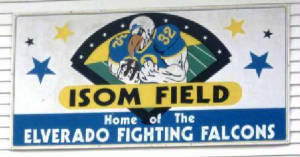 To win a Regional title for a small school in the 1930s meant you had to beat high schools from some much larger towns. If you have any information behind these title years, or any other years of EHS basketball, please write to us via e-mail at ihsgdwebsite@comcast.net . Team records and coach's names, as you can see, are being sought. Several scores involving Elkville High School participating in the IHSA State Tournament are available on a website titled "Illinois Postseason High School Basketball Scores." Centralia won IHSA State Title. McLeansboro finished 4th in IHSA State Tourney. **Possibly school's last game as Elkville High School. The Elkville Bluebirds won or shared 6 conference championships in a 10 year stretch from 1952 to 1961. The records and coach's names for these teams are listed below, coutesy of Tom Sikorski!